Dimensions 7.25W x 5.5H x 7.25G in. 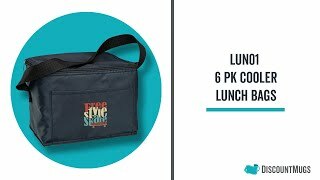 These custom printed lunch bags and coolers make great giveaway items. With a classic design, our lunch totes are sure to reel in a number of your target audience. Available in an array of rainbow colors that include blue, orange, red, yellow, black, gray and green, there’s a color for every one of your advertising motifs. Order printed with your company logo and promote your business while giving your customers useful coolers that they can use for a wide variety of applications. These traditional cooler lunch bags are large enough to fit 6 cans of your favorite beverages, and feature a main zippered compartment with inner white lining for insulation. Rest assured your contents will stay safely in place. Perfect for my family reunion.